&apos;ATTENDING A NEW SCHOOL COULD BE A DANGEROUS PROSPECT.&apos; As Chicago prepares for its largest-ever round of school closings, Tom Kompare, a member of Chicago&apos;s vibrant Open Government Chicago programming movement, has created a new Web application called "Go to School!" 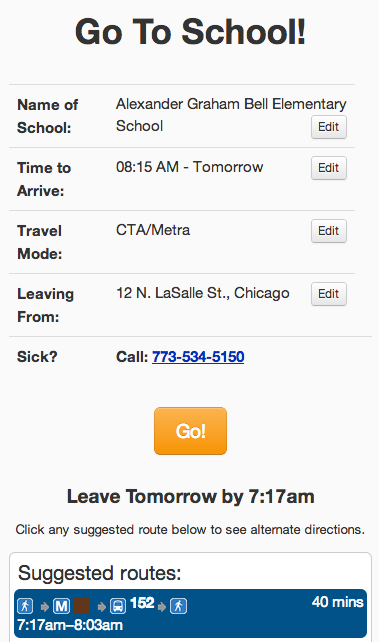 -- to help families across Chicago gauge "their travel options." That includes, as he explains in an email to the group, "locations of police stations, fire stations, and hospitals." He says it started out as a selfish exercise: "I sometimes get to work from home and get to pick up my daughter after school. I need to hop on the L do so, and was wondering when I had to leave in order to get there on time." The app&apos;s up and running now, with maps showing which schools are closing or relocating. By this fall, he expects to add so-called "safe haven" businesses and crossing guard locations. It works on smartphones or desktop browsers. Check it out at cps.go2school.org. Meanwhile, Kompare is making the source code available here to anyone who wants to adapt it for use by other school districts. * Student protests escalate, along with fear over violence. * Chicago putting more cops on foot patrol along dangerous blocks. Suggestions for this blog? Email anytime. A MILLIONAIRE AT 17. British teenager Nick D’Aloisio has sold his news-reading app, Summly, to Yahoo for a figure reportedly in the tens of millions of dollars. And how was your Monday? * Spotify targets Netflix, HBO with streaming video, including original content. * Facebook finally adds "Reply" option to comments. * Facebook founder Zuckerberg creates organization to promote immigration reform. * Mayor Bloomberg seems to suggest Rupert Murdoch stay off Twitter. &apos;HI, IN THE PAST 2 YEARS, YOU HAVE ALLOWED ME TO KILL 70,000 PEOPLE.&apos; The Onion makes fun of Syria&apos;s president, Bashar al-Assad. Or is it making fun of everyone else? * UN pulls staff out of Syria because of deteriorating conditions. NFLer OUT OF THE CLOSET? CBS Sports reports a current NFL player is considering coming out publicly. His main concern, the report says, is that he&apos;ll be in jeopardy from homophobic fans. * Get this blog by email, free. Sign up here. * Follow us on Twitter: @WBEZ and @Meyerson. * Looking for the most recent WBEZ Meyerson News Quiz? Here you go.